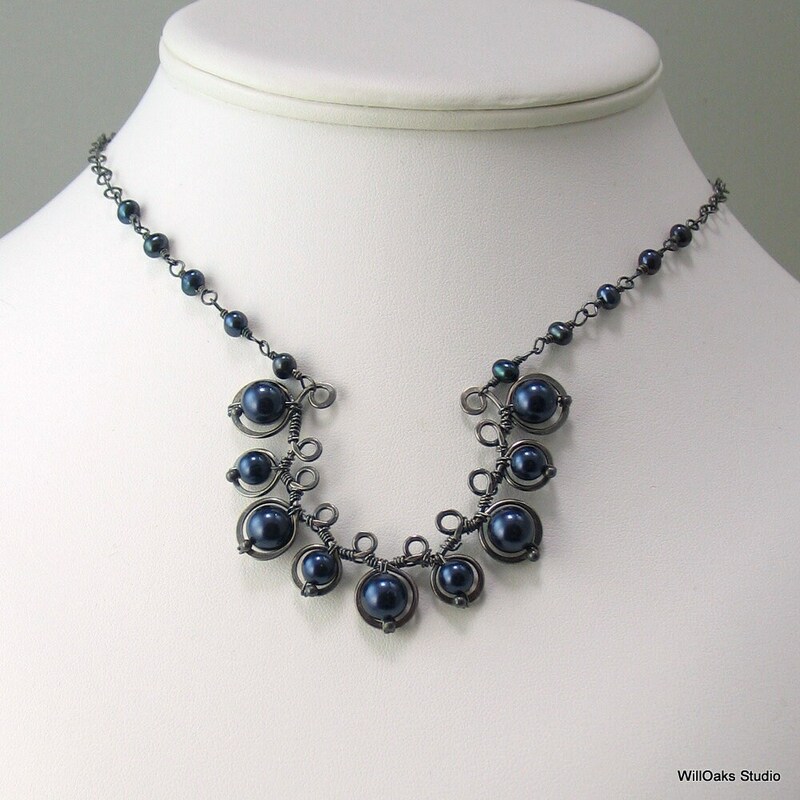 A filagree semicircle, hand forged in antiqued silver, features rich deep navy blue crystal pearls which alternate between 6mm and 8mm. 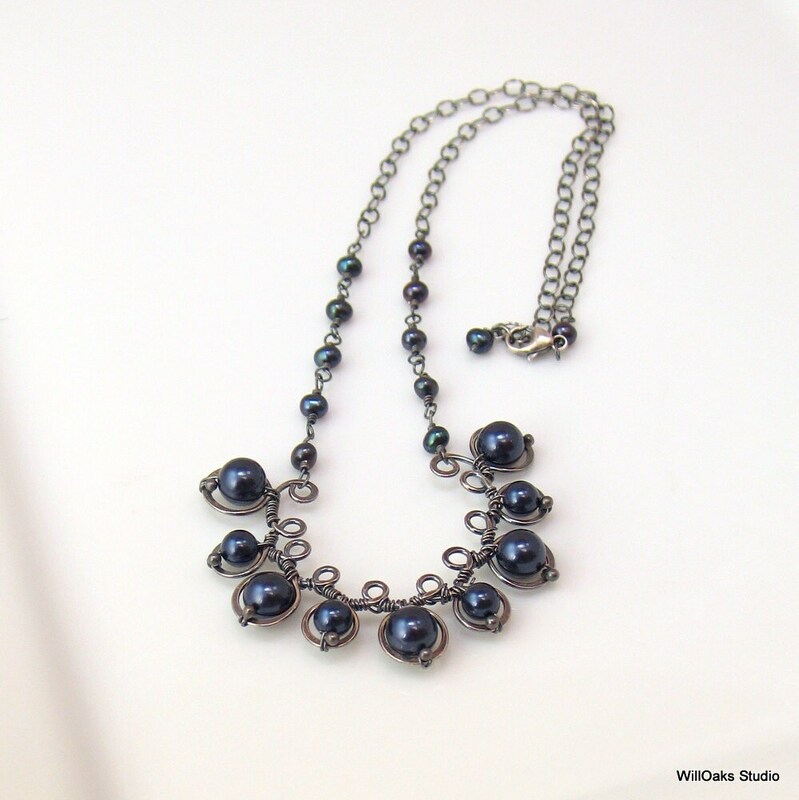 Worn hanging from an antiqued sterling silver chain and freshwater pearl links. Maximum wearing length is about 18" and can close shorter as the clasp can close on any link in the cable chain. Pendant measures about 2 1/4" wide by 1 7/8" tall. Swarovski crystal pearls in a very dark blue, named "Night Blue", sized 6 mm and 8 mm, are integrated into the filagree with handmade balled sterling head pins, oxidized for color. 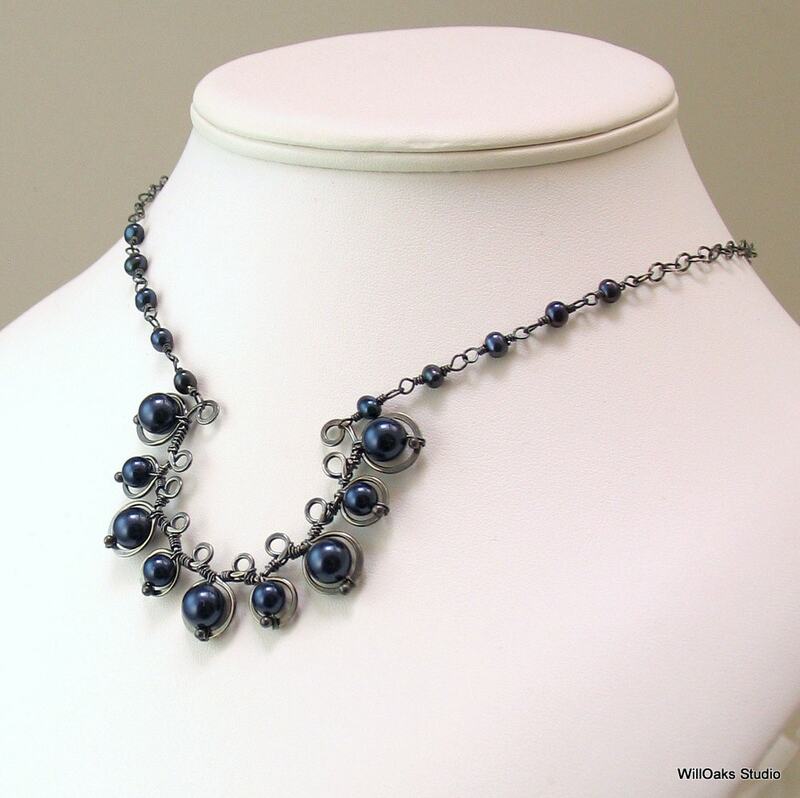 Small freshwater pearls, in a very similar dark blue, create links with sterling wire wrapping, to attach to a sterling cable chain, also finished with an oxidized, antique silver finish. Clasp is connected with a pearl and wire link, and a final pearl dangles from the end of the chain. Heavy gauge sterling silver-filled wire is used to form and hand forge the filagree pendant. Silver-filled wire features a heavy "tube" of sterling and a core of jeweler's brass for the look, wear and function of sterling silver and a cost savings. 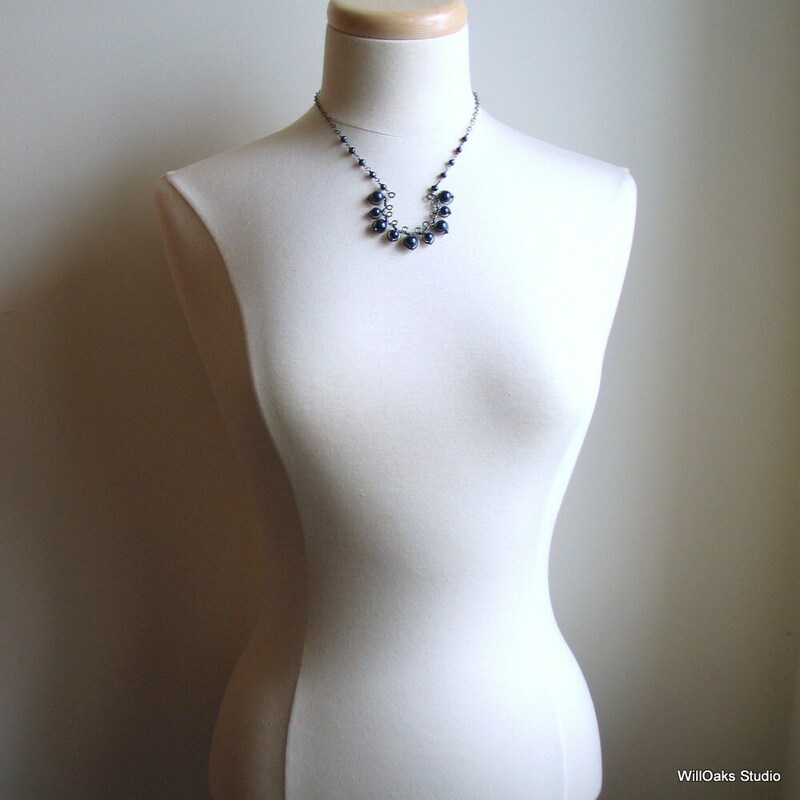 The chain, findings, and all the finer wire used to construct this original artisan design is sterling silver, hand oxidized here in my studio. 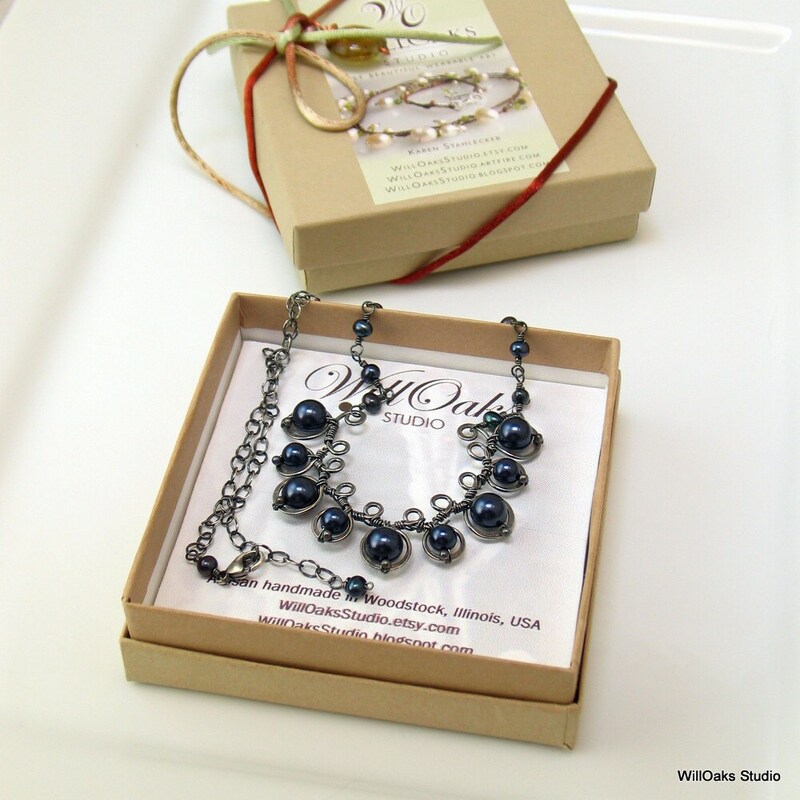 Comes packaged in my signature box, designed to both protect and display the pendant when not being worn.